Home Audio Dayton Audio DTA-120BT Review: What Can a $100 Amp Do? Can audio enthusiasts get pleasure out of a $100 amplifier? Amplifiers are an important part of any home theatre setup, offering the much-needed power to your speakers and headphones for a rich audio experience. 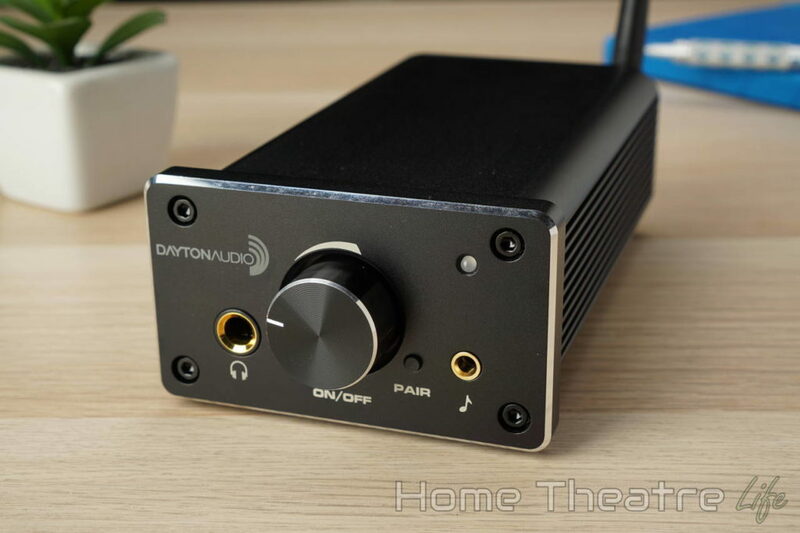 Coming in at under $100, the (relatively) compact Dayton Audio DTA-120BT aims to provide a comprehensive solution for stereo listening, fusing a desktop amp, headphone amp and Bluetooth audio receiver into one sleek package. 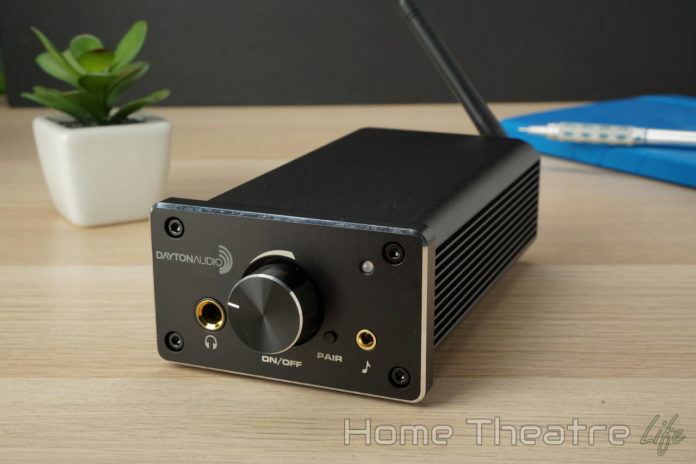 In this Dayton Audio DT120-BT review, we’ll take a look at the hardware, run some tests and answer the most important question – is the Dayton Audio DT120-BT worth it? 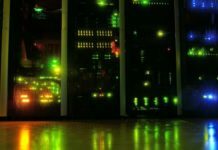 5 Should You Buy DT120-BT? I really liked just how many inputs Dayton Audio managed to cram into the DTA-120BT, as I was easily able to hook it up to everything I wanted to. The addition of Bluetooth 4.2 with aptX support is a massive plus compared to the previous model, allowing you to cast high quality audio wirelessly straight to the amplifier for wireless Hi-Fi listening. 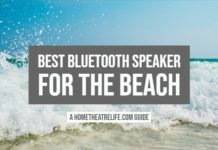 In terms of raw power, there’s plenty of grunt to drive a set of desktop speakers, a stereo sound system, outdoor speakers or more. Just be aware that the 60W RMS power output per channel quoted is only for a 4-ohm source. With most speakers coming in at 8 ohms, that falls to 40W – not a dealbreaker but something to be aware of. 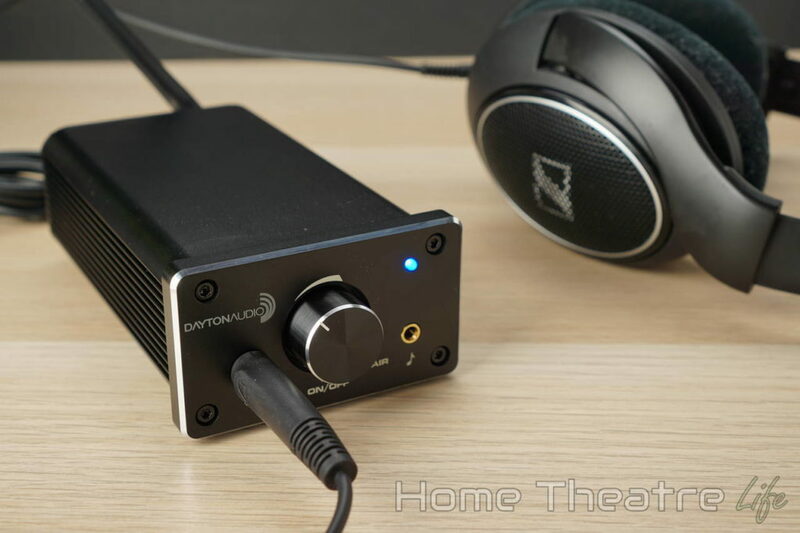 There’s also a separate solid-state headphone amplifier stage that lets you drive high impedance headphones that smartphones and other devices struggle to drive. I have to admit I was really impressed with all the inclusions Dayton Audio have provided here – particularly when you consider the amplifier’s budget price tag. There really is everything you need to get the most out of the amp included in the box – something that’s surprisingly rare – even on high end audio equipment. The Dayton Audio DTA-120BT is an impressively built unit. Thanks to its extruded aluminium body and faceplate, the unit weighs a tonne and everything feels well made. The front of the unit features a 1/4″ headphone jack for audio output, a large volume knob (that doubles as a power button), a pairing button for pairing up your Bluetooth devices (more on that later), power LED and a 3.5mm audio input for standard aux cables. Around the back you’ve got power, Bluetooth antenna, audio outputs and RCA audio inputs. I really didn’t like the dual purpose power knob as it means you need to set your volume every single time you turn on the amp. I would have preferred a separate power button, though I understand putting one on the already busy front panel may have been too much for some. The power LED is also a bit bright which can be quite distracting in certain setups. That said, having the 3.5mm audio input and 1.4″ headphone jacks at the front of the unit made it easy to connect up headphones or audio sources without needing to touch the more “long term” connections at the back. The unit’s footprint is surprisingly compact given the power and features under the hood. However, the massive 24V 5A power supply is basically as big as the amplifier itself which was a bit of a pain to hide if you’re space is limited. I really like that the power supply supports worldwide voltages and uses a standard figure 8 cable so it’s easy to get a local replacement rather than needing to deal with awkward travel adapters. 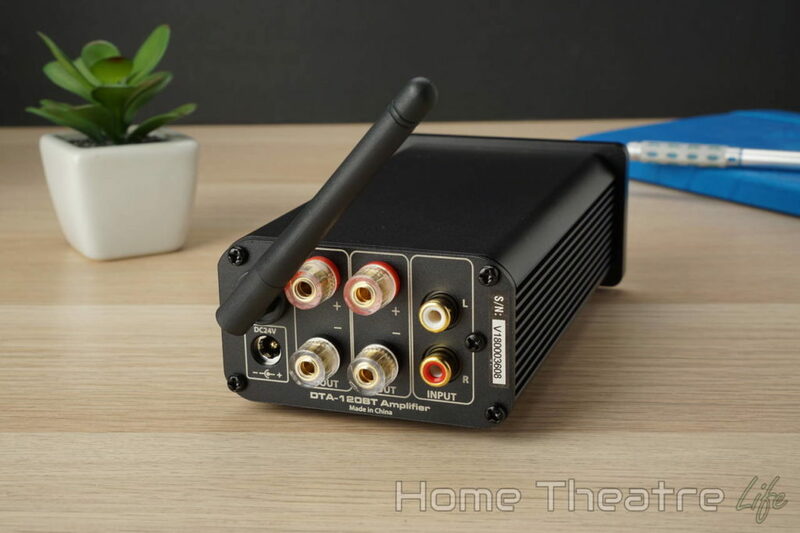 Whether you’re wanting to hook up your PC using the RCA jacks at the rear, hook up your smartphone via Bluetooth or even using the old 3.5mm aux cable, getting music playing through the DT120-BT was a smooth experience. 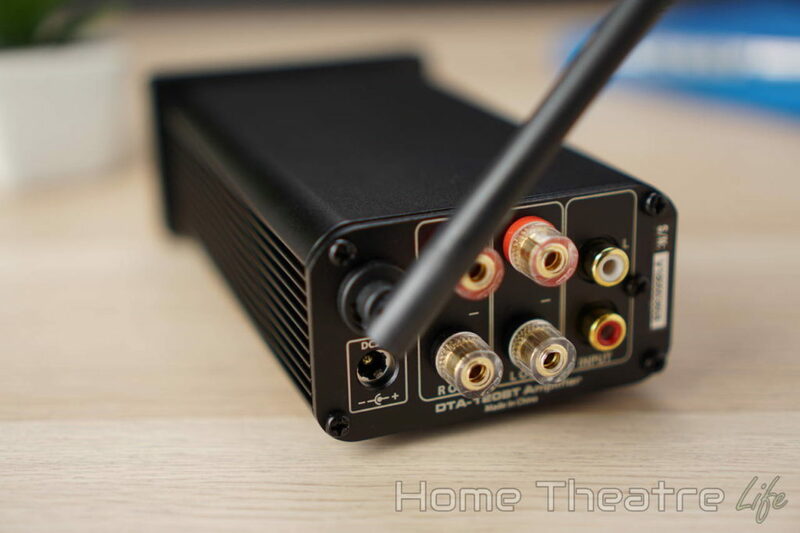 The unit prioritizes certain connections in the following order: Bluetooth>3.5mm>RCA. This allows you to easily hook it up in a permanent configuration whilst still being able to take advantage of the other audio sources without issue. That said, you need to make sure you unpair your smartphone each time or you’ll be scratching your head why you’re not getting any sound. Speaking of Bluetooth, pairing up your smartphone via Bluetooth is relatively straightforward. Pressing the Pair button on the front of the unit puts it into Pairing mode. 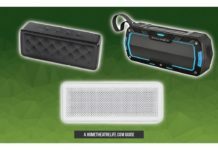 You can then select it from your smartphone like any other Bluetooth speaker. My phone reconnected relatively quickly for a smooth experience. 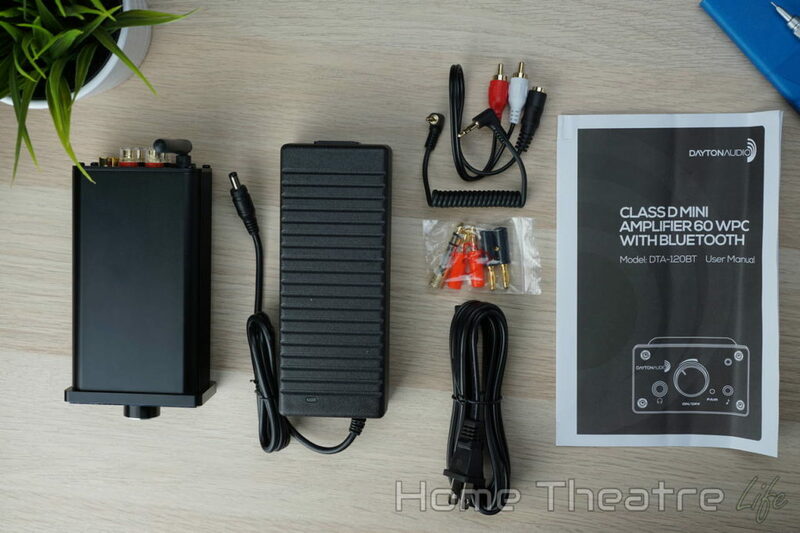 Of course, many will also use it as a headphone amplifier which is easy thanks to the front mounted 1/4″ headphone jack port most audiophile-grade headphones use. If you’ve got headphones with a 3.5mm plug, you can use the included adapter instead which is handy inclusion. 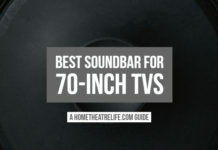 After connecting up a set of bookshelf speakers using the rear audio outputs and included banana plugs, I had no issue driving my speakers at impressive volumes. Whilst you shouldn’t expect a $100 amp to compare to far pricier audiophile-grade amplifiers, audio quality was pleasing with powerful, clean audio and excellent clarity. Some may find it to sound a little bright but I tend to prefer brighter audio as it makes death metal come alive (which makes up 90% of my music collection). Hooking up my Sennheiser HD598s offered the same pleasing audio experience, particularly when compared to my PC’s onboard audio. 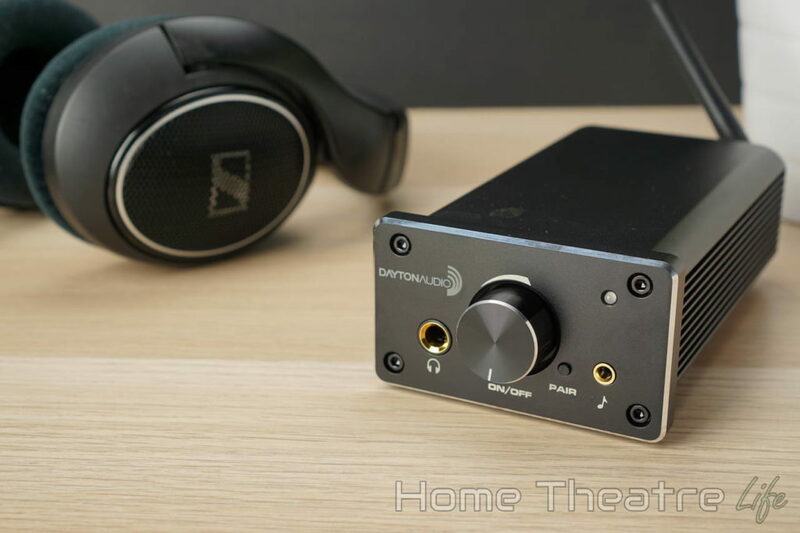 Whilst the Dayton Audio DT120-BT isn’t going to replace a high-end audio amplifier, the company have managed to cram an impressive amount of value into its $100 price tag. 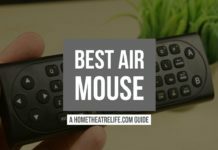 Whilst it has some quirks you need to be aware of, it’s a great choice for desktop listening such as with a PC, or to set up a powerful stereo system around the house, in a garage or even outdoors – particularly if you’re on a budget. With plenty of connectivity options (including Bluetooth with aptX), solid audio quality, and a compact design, the DT120-BT is a perfect companion for those wanting a solid amplifier without breaking the bank. The Dayton Audio DT120-BT is available from Parts Express for just under $100.